Thank your barista. She is a beacon of wisdom. Snow, snow, go away. Being from FL, I can not relate, but I think the barista was clever and probably made a lot of people smile! I love it! It is not really the snow but they gray deadness of winter here in Massachusetts. I long for Memorial Day. 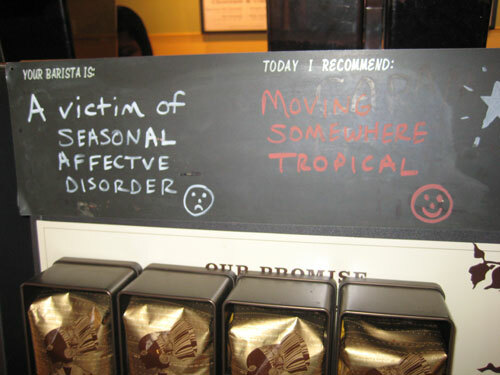 Why, I’d love to move somewhere tropical, thanks Starbucks!!!! Seriously, I hate winter…it’s cold, gray, dead and all around suckass. Can’t wait for Spring. I’m right with you. March just sounds like it SHOULD be spring! Well, it’s not. Not even close. “They” say that it is the snowiest month in Minnesota. How depressing is that?? lol! that was awesome. i live in pa and i am totally with your barista! Love it. I am so ready for spring as well. I have come to resent the cute sweaters and gloves and scarves and jackets I look so forward to about November because they are novel. Well, let me tell you that the tropics (Mexico, Caribbean) are not much to speak of this winter. This is the coldest winter we can remember and everyone is complaining about the cold. We’re normally in the mid 90s by this time of year and have been since February. This year, well, you don’t even want to know how cold it has been. I’m pretty sure it even got in the 50s one night. It just isn’t FAIR! Hmph! Have to agree. I was in Indianapolis on Friday and Saturday of last week — is it always that windy in your city? That was harsh! ^ ha complaining about it being in the 50s. it’s going UP to the 50s at some point this week and I’m looking forward to it! OMG It’ll be warm outside! And there will be a sun and everything! WOOOOO! Let’s all move somewhere tropical. Great photo! What an awesome barista! It’s not so much the cold that bothers me but the lack of sunlight. I don’t have SAD but the dreary, gray skies depress me. For the past two months, everyday has been overcast. The trees are barren and stark. The grass is yellow. In the Midwest, there is no place to escape from it, north or south or east or west. The landscape remains the same. I didn’t realize it would bother me so much but it does. Then, a few days ago, I saw hope. My daffodil bulbs are sending up stalks of green. Finally, a sign of Spring. Amazing how such a tiny thing can make me so happy. I would like an iced white mocha with no whip and a seventy degree day! Pleaasseeee! I am getting desperate here! I actually slept in my housecoat last night. Oh yeah… grande cup of sunshine with whipped cream yes please. Everyone was smiling as I walked down the street at lunch. All it took was the sun to shine. Thanks for making me smile PQ. I’ve been whining about spring coming since about January. I am a gardener, so I want to grow things. I also get S.A.D. most years. I didn’t really get it back in So. Cal, but I do now that I live in Utah. I use really bright lights in my room, and I have a light box I need to use. Moving upstairs instead of living in a basement room surely helped, too.